Interested in understanding the curriculum of the MScOT program at U of T, and the theoretical frameworks that shape it? This video will tell you all about the curriculum, and the Educational and Professional Conceptual Frameworks. 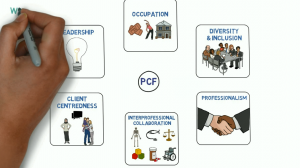 Also, read about the Educational Conceptual Framework (ECF) and the Professional Conceptual Framework (PCF), and access the e-learning modules on the ECF on our site at MScOT Program & Curriculum Materials. This entry was posted in news on October 9, 2018 by alalani.